Hanuman Chern Tong (Hanuman waving a Victory Flag) is one of the rarest Pim Niyom (preferred models) of the pantheon of amulets of the Great Luang Por Guay of Wat Kositaram. This particular exhibit is made from Nuea Pong Puttakun and Ittijae powders. The amulet has a very hardened dry and coarse consistence, which lends a very matt texture to the surface of the amulet. Hanuman is the symbol of Loyalty, for his unwavering dedication and selfless service to Prince Rama as told in the Ramayana. Hanuman is very charming, super strong, invincible, cannot die, wily and clever, and is the commander of all the Vanora Devas as their General. Hanuman can not only protect from dangers, black magic and ill fate, he can also bring winners luck to gambling tables, is an able seducer of maidens and nymphs, and is more or less a winner in every walk of life. 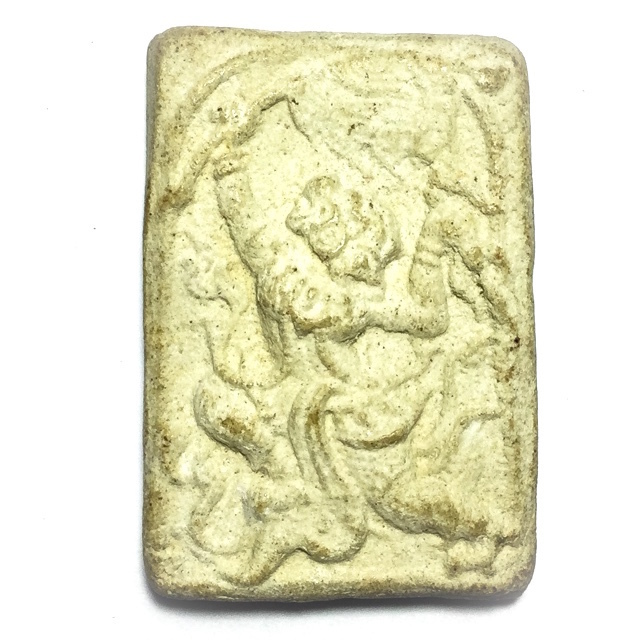 The Hanuman Nuea Pong of Luang Por Guay was pressed in a number of different postures, all in very small numbers, and all of which are now amongst the rarer amulets of Luang Por Guay. Some were pressed with has the Sacred Yant Jom (indented Yantra) on the rear face,. His strength is immense and second to no God, for which reason he is the mascot and revered Deithy of Muay Thai Warriors, who call upon the power of Hanuman to defeat their contestants and opponents in battle in the ring. The Winning Power of Hanuman, will clear the way of difficulties, whilst making all ventures successful. This exhibit is an extremely well preserved and beautiful example, that is of the highest sacred Value for devotees of Luang or Guay, and for collectors for preservation and study, as well as most certainly worthy of entering into competition for prizewinning. We feel this amulet is most capable of first prize status. The stories of confirmation of their power are more than can be counted, and his great Patipata and Exceedingly Powerful applied methods of Sorcery are a large part of what attributes to their power. tIn addition, he would perform empowerments during the various 'Reuks' (Astrological Influential moments), to bring total coverage of protection and fortuitous blessings to all who might wear and Bucha his amulets. His method involved the choosing of the 'Reuks Mongkol' Buddhist Auspicious alignments, the 'Reuks Jone' (Gangster Alignments) Inauspicious Alignments, and the 'Reuks Bun Paya Marn' Demonic Influential Alignments. This means that it did not matter who wore his amulets, Good people would wear them, Gangsters would wear them, anybody could wear them without loss of magical effect. Luang Por Guay was an Ajarn Sak who was very dedicated to the creation of authentic amulets using the ancient traditional Wicha. His Sak Yant did not have much Khom Agkhara lettering embellishing it at all, and were usually one single Yant. Sometimes small, or sometimes large enough to fill the whole back. Most Looksit would only come and get get Sak Yant once, or twice. At the most, three times would be the maximum that a Looksit would come to add. His compendium would begin the composition as follows; the first Yant would be a Yant in the middle of the chest, and one more Yant on the back. If anyone wished for extra they could return and get more. If he laid more on, he would place Hanuman on the flank. If that wasn’t enough for them, he would add a tiger. But there were very few Looksit who ever got the tiger.